William Lovell was born in Hamilton in January 1897, the middle child of William Lovell and Margaret Dickie’s family of five children. William Lovell Sr was a blacksmith and the family lived in Gray Street then later moved to Penshurst Road, Hamilton. William Jr, known as Gus by his family, attended the Hamilton State School and then worked as a butter maker. On Easter Monday 1915, William was best man at his eldest sister’s wedding. 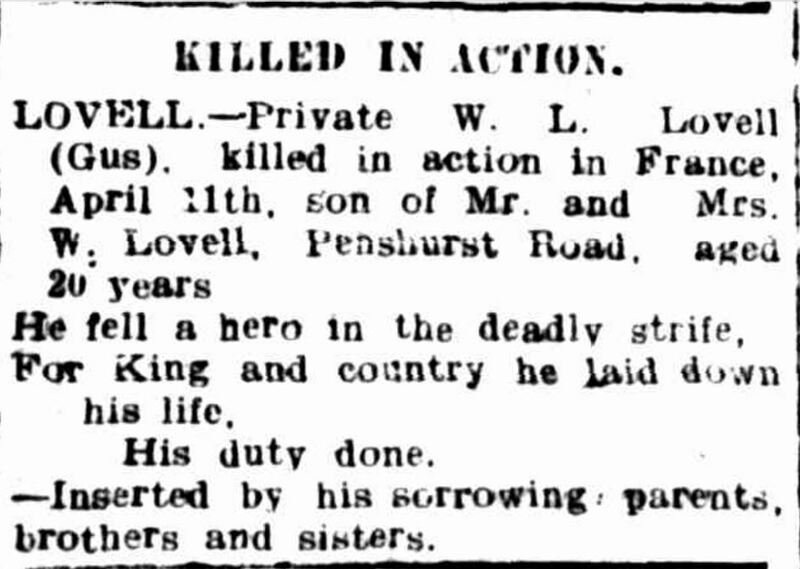 That would be the last Lovell family celebration before William enlisted on 12 May 1915. At the time of his enlistment, William was eighteen years and four months old. He had tried to enlist before but due to ill-health, was rejected. 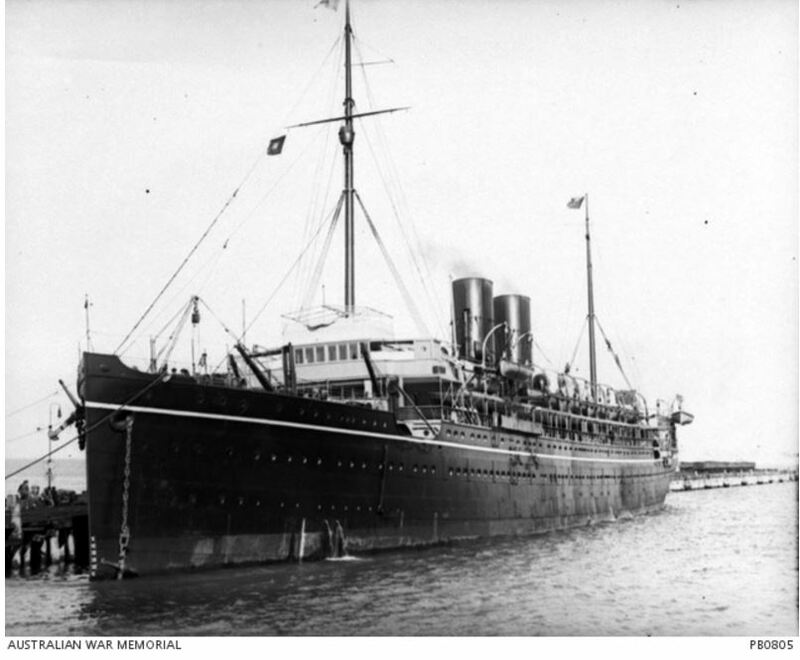 With the 14th Battalion 7th Reinforcement, William left Australia on 10 August 1915 aboard the HMS Persia (below). In October 1915, William proceeded to the Dardanelles, joining the 14th Battalion on 23 October on Moudros were they were resting after time already spent at Gallipoli. On 1 November 1915, the 5th Battalion returned to Gallipoli and disembarked at North Beach, Anzac and took up position at Durrant’s Post. By 18 November, William was sick and transported to Moudros suffering rheumatism. 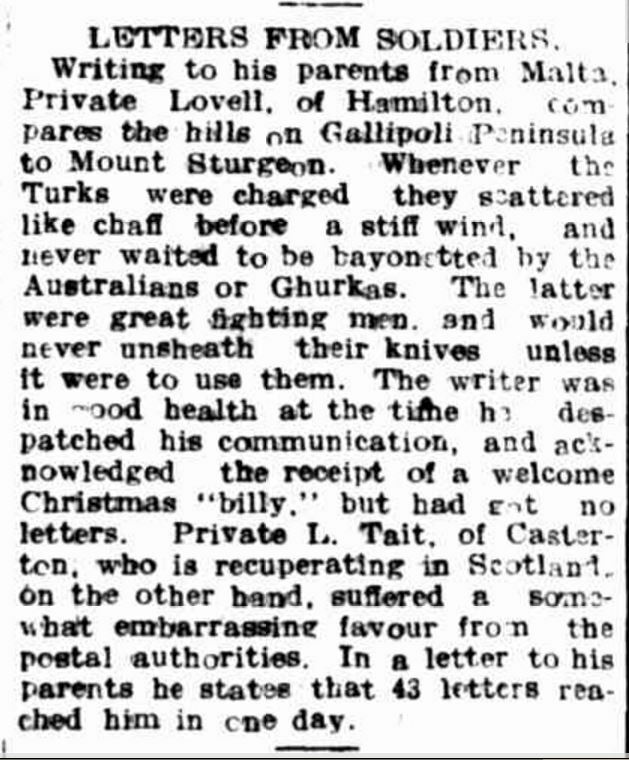 He went on to Malta on 19 November 1915 where he wrote a letter home to his parents describing the hills at Gallipoli as similar to the Grampians’ Mount Sturgeon near Dunkeld. He’d also had plenty of letters from home, receiving forty-three in one day. “LETTERS PROM SOLDIERS.” Hamilton Spectator (Vic. : 1870 – 1873; 1914 – 1918) 12 Feb 1916: 4<http://nla.gov.au/nla.news-article120411677&gt;. I can tell you things are pretty lively over here. There is some big stuff flying about and they don’t stop to let you have breakfast. We went into the firing line on the 6th August, aud that night or rather the following morning the Germans counter attacked our trenches. I had a little bit of excitement. When the alarm was given some of use were cleaning out a big German dug-out in our line, so that we could have a bit of a rest in the day time. Their dug-outs go about 15 or 20 feet under ground, and are very strongly built. When the alarm went one or two of the boys got up on top. I was about half way out when a bomb was hurled and killed or wounded all in front of me, and knocked me back in quick time, I thought I was blind. When I came to I scrambled out, and found I was on my “pat” and about half-a-dozen bosches making their way towards me. I shoved ten bullets into my magazine, and took a steady eye and straight aim, and got a sure bell first pull. I accounted for a couple more with the rifle, and then presented them with a bomb. When I looked round I found that some of the enemy had got at the back of me, and sent over a bomb or two (souvenirs). I got in a shell hole, and quietened one or two of them. Then I met one of our chaps coming along the trench, and he told me there were some of our men further along, so we made our way along to them. The Germans then started giving themselves up, and singing out for mercy. I am in Lieutenant Jacka’s V.C. platoon, and there were only four or five left out of it. He got wounded in six or seven places. I stopped a piece of bomb (only a wee bit, nothing to worry about) just a bit above the knee of the right leg, and got hit in the thumb, and had my right arm bruised. Morrie got hit in the right shoulder, the arm and face. I think he will go to England. I am as deaf as a beetle, but suppose that will wear off in a day or so. We took a lot of prisoners, and completely routed the enemy. I hear the boys have advanced a few hundred yards since I left. The German infantry are poor, what I saw of them. They are fine built chaps, but do not seem to have much idea of fighting. They will not stand to the bayonet. I used to enjoy shooting rabbits, but I think this is as good as it. The shells that are sent over leave holes as big as a house. The Germans say that we reckon we get big bombardments, but they reckon we don’t know what one is. They say we ought to be over their side when the British are bombarding. There’s apparant bravado in William’s letter. His earlier letter home reveals his confidence as does his portrait taken prior to his departure. After further research into the events of 7 August 1916, the reason for the tone and content of his letter became obvious. As William mentioned, he was part of Albert Jacka‘s 5th platoon, known as “Jacka’s Mob”. The actions on 7 August 1916 of Captain Albert Jacka, already with a Victoria Cross (V.C.) from Gallipoli, saw him awarded a Military Cross for his extraordinary efforts, although a second V.C. was thought more appropriate. The story of “Jacka’s Mob” on that day is well documented and William’s account very much as it happened. The adrenalin running through the veins of that nineteen-year-old lad, even in the days after in hospital at Etaples, must have been immense. On arrival at Graylingwell War Hospital at Chichester on 16 August, it was not surprising William received a diagnosis of mild shell-shock. Captain Jacka too, who was shot several times, was exhibiting signs of the mental strain of Pozieres even after he returned to the frontline from hospital. 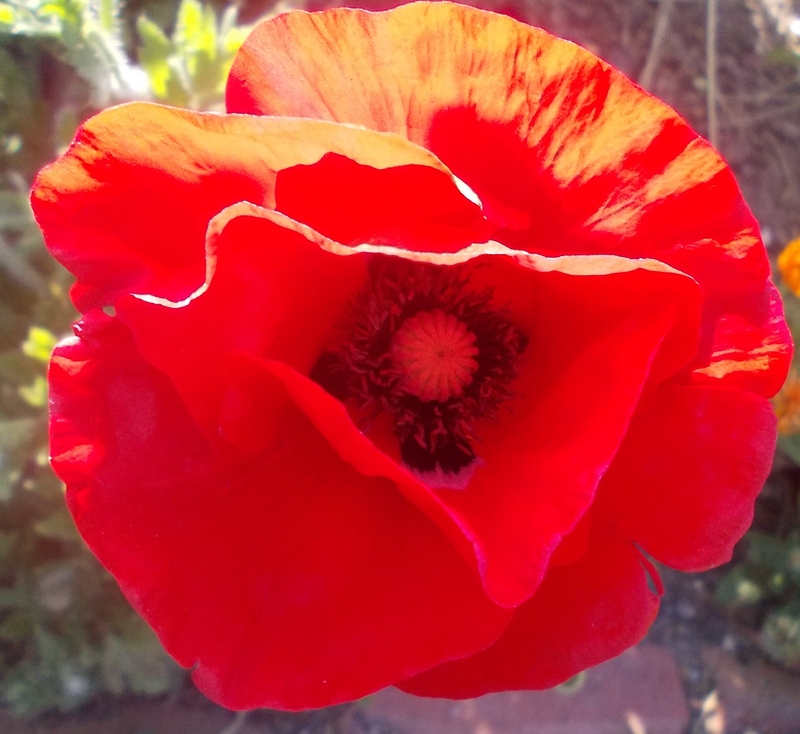 (FitzSimons, Peter Fromelles & Pozières : in the trenches of hell. North Sydney, NSW William Heinemann, 2015. p273). 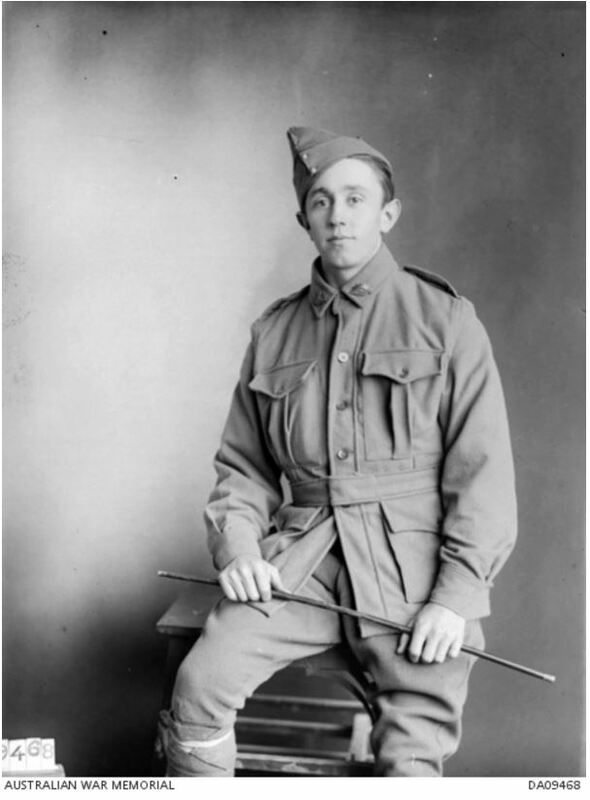 Morrie, who William talks of, was Maurice Melville Lewis of Penshurst also with the 14th Battalion 7th Reinforcements. Morrie went to hospital at Wandsworth, England and it was May 1917 before he rejoined the battalion. You can read more about the actions of Albert Jacka and “Jacka’s Mob” on the day of 7 August 1916 here. After William left hospital at Chichester, he went to Perham Downs, England for furlough and repatriation until 11 November 1916. He then trained with the 4th Training Battalion at Codford. William returned to France on 16 February 1917. 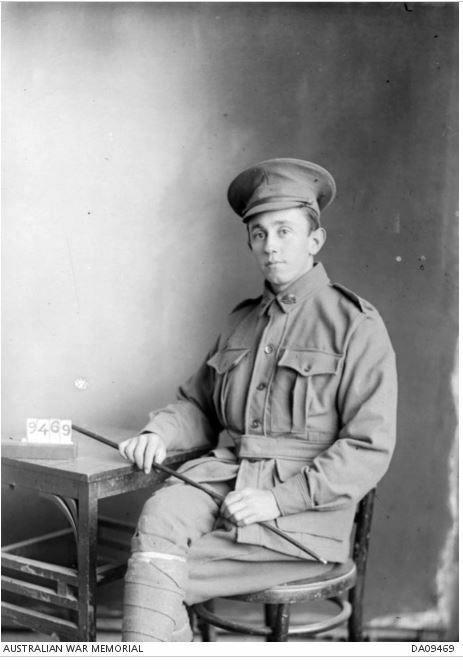 He rejoined the 14th Battalion on 12 March 1917. On 3 April 1917, the battalion received orders to go forward to Noreuil, France from its location at Beugnatre to arrive on 7 April. The 14 Battalion’s next major battle, as part of the 4th Australian Infantry Division, was at Bullecourt and the Hindenburg Line and beyond their objective. In the early hours of 11 April, the battalion attacked the Hindenburg Line. The plan involved tanks moving into place ahead of the infantry. It was soon discovered one tank was out of action, put the remaining tanks proceeded but were late in reaching position. Battalions of the 4th Australian Infantry Division began moving into position at 2:15 am on 11 April. Amongst the barrage was William Leslie Lovell. At some point, most likely during the morning of 11 April, the brave young soldier was killed. He was just twenty years of age and in his two years of active service, he saw more than any person should witness in a lifetime. No details of his burial were given and with his name on the Villers-Bretonneux Memorial, it’s likely William still lies in the fields of northern France. The sad news reached Hamilton and the Lovell family were feeling their loss. “Advertising” Hamilton Spectator (Vic. : 1870 – 1873; 1914 – 1918) 5 May 1917:<http://nla.gov.au/nla.news-article119848984&gt;. William’s mother Margaret planted a tree for her son along Hamilton’s Anzac Avenue in August 1917. William’s name is also on the Hamilton War Memorial and the St. Andrew’s Presbyterian Church honour board. Oh how are hearts are aching. And longing, dear Willie, for you.